Concerns continue over the Exide battery plant cleanup. Angie Crouch reports for the NBC4 News on Friday, Aug. 4, 2017. Young children play in the back yard under the shade of an avocado tree. The kids dig holes while their grandfather makes homemade guacamole. It’s a scene that’s played out at the Mariz family home in Maywood for years. “They found lead throughout my front yard but not as bad as the backyard. The backyard is worse,” said Reynaldo Mariz. Lead levels are so high that state officials have told Mariz to stay out of his backyard until it’s cleaned. But until recently, his grand kids played in the contaminated dirt all the time. “What’s going to happen to the kids after they go through that?” wonders Mariz. Angelo Bellomo, deputy director for health protection for the Los Angeles County Department of Public Health, says children exposed to lead are at serious risk for long-term health issues. “It effects brain development. It can cause developmental disabilities, in lower levels, over prolonged periods of time. It could decrease the learning capacity of individuals. So the impacts of lead, even at low levels can be devastating to communities,” said Bellomo. For years, batteries were recycled at Exide and potentially dangerous chemicals released through the stacks into the communities of Maywood, East Los Angeles, Commerce, Bell, Vernon, and Huntington Park. Mariz can see the cause of his concern from his driveway. A white exhaust stack at the now-closed Exide Technologies in Vernon. For years, batteries were recycled at Exide and potentially dangerous chemicals released through the stacks into the communities of Maywood, East Los Angeles, Commerce, Bell, Vernon and Huntington Park. 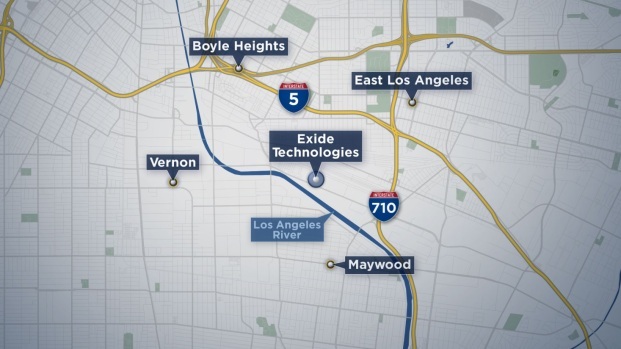 This map shows the locations of the communities of Maywood, East Los Angeles, Commerce, Bell, Vernon, and Huntington Park in relation to Exide Technologies. “The facility released harmful toxic chemicals into the air, including lead, benzene, and 1,3-butadiene,” according to a report from the Los Angeles County Department of Public Health. That same agency is now in charge of cleaning up Exide’s mess in the communities near the plant. In April 2017, Gov. Jerry Brown and the California Legislature approved $176.6 million for the cleanup but the agency says that’s not enough for the entire project. “That’s enough to sample about 10,000 properties in this area of 1.7 miles and to clean up 2,500 properties with the highest lead concentration and greatest exposure to the population,” said Mohsen Nazemi, Deputy Director, Brownfields and Environmental Restoration Program at DTSC. 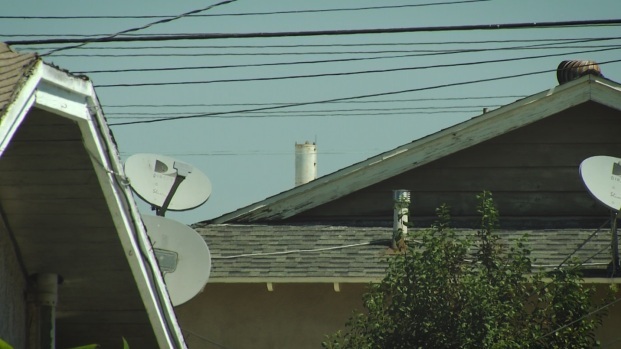 But DTSC’s plan leaves more than 5,000 homes with toxic lead on their properties at levels above what is currently recommended by California’s Office of Environmental Health Hazard Assessment. Those homes will not be cleaned up unless additional funds are found. Los Angeles County says the plan also ignores many of the concerns they shared about the DTSC’s cleanup plan. “Frankly, it’s not acceptable to either the community or the health department,” said Bellomo. Los Angeles County officials say DTSC should be cleaning up the contamination block-by-block and not house-by-house and that its methodology for selecting cleanup locations is flawed. The County is also concerned about contamination spreading from homes that aren’t being cleaned up and they question DTSC’s plan for cleaning the interior of the contaminated homes. “DTSC’s final cleanup plan falls short in protecting the health of the community,” said Barbara Ferrer, PhD, MPH, MEd, director of Los Angeles County Department of Public Health, in a recent press release. “DTSC’s plan will take two years to clean 2,500 properties. This does not reflect the urgent risks that lead contamination poses to the people in these communities. We urge DTSC to revise their methodology and work at a faster pace,” she adds. Liza Tucker of advocacy group Consumer Watchdog has been studying DTSC for years. “It’s very clear to me that they have a finite amount of money and it is not going to cover the entire cleanup in order for it to be done properly,” said Tucker. Tucker is concerned about the speed of the cleanup and the number of properties being included. But she was most worried about the cleanup standards being used by DTSC for the project. Reynaldo says he has been growing his own avocados for years. And, the NBC4 I-Team found neighbor after neighbor with fruit trees on their property. An avocado tree is pictured on Reynaldo Mariz’s property in Maywood. “They are not cleaning up residences in the Exide area enough to prevent serious damage to the IQs of children who may be eating the food that is being grown in their backyards,” said Tucker. Lead contamination is measured in parts per million. The Federal Government recommends 400 parts per million for soil clean up. That’s the number DTSC is using to determine which homes to clean up first. Any home above 400 parts per million or with a hot spot of 1,000 parts per million will get cleaned up. That’s about 2,500 homes. The 5,000 or so homes below 400 will have to wait for more money. This graphic shows representative lead soil concentrations at more than 7,000 parcels. But California’s own health experts have much stricter guidelines for cleaning up lead. They recommend 80 parts per million; 5 times more protective that what DTSC is using to select which homes will be cleaned. That means that the 5,000 homes not being cleaned up will have lead levels on their property that exceed California’s own guidelines. And, for homeowners who are growing their own food, like Reynaldo, whose home has over 1,000 parts per million of lead in the soil, the DTSC has used an even more protective number on other local cleanup projects; about 6 parts per million. That’s 68 times stronger than 400 parts per million being used to decide which homes are cleaned with money on hand. “You are actually risking major damage to the IQ of your children who are eating that food as they grow and the DTSC is not telling people that’s the case,” said Tucker. “That’s not the case,” said Nazemi. He says DTSC looked at the health risks of eating homegrown food from the contaminated properties in its Environmental Impact Report. “We needed to prioritize which 2,500 should be cleaned up first and the ones that we picked were those that are representative over 400 parts per million which is the Federal standard for cleanup for children,” said Nazemi of the DTSC. DTSC says it will clean up all the homes over 80 parts per million if it gets the funding. The agency says it will pursue Exide in court if necessary, but concedes that the process could take years. “The cleanup plan goes far enough if we get the funding,” said Nazemi. But a current DTSC employee has raised concerns about his employer’s ability to manage the Exide community cleanup properly. Both Tucker and Bellomo agree that DTSC is failing in its responsibility to clean up the contamination properly. “DTSC has hundreds of very dedicated professionals working there. What we have currently is a breakdown in leadership and we’re going to have to continue to be vigilant,” said Bellomo. Reynaldo Mariz was told by the DTSC that his home would be cleaned up in July. But that process has yet to begin. “I’d like to see it cleaned where you can eat off it to tell you the truth,” said Mariz. There are Comments Off on EXIDE VERNON BREAKING NEWS: Exide cleanup under fire for leaving homes with contamination and California state agency claims plan meets federal standards.